Spiral Staircase Kit (8 ft.-0 in. to 8 ft.-8 1/2 in.) 11 Risers Are Used For Industrial, Commercial Or Residential Applications. Spiral Staircase Kit (8 ft.-0 in. to 8 ft.-8 1/2 in.) 11 Risers are constructed of diamond plate aluminum, diamond plate galvanized, diamond plate steel or smooth steel for long lasting durability. Kits available in various styles, colors and diameters. Provides simple installation instructions, step-by-step DVD and all hardware. 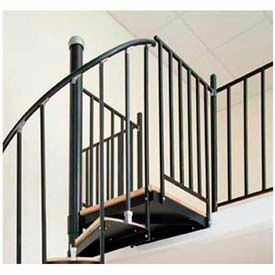 Code-compliant models include safety-return handrail ends and riser bars. Staircase reaches height of 8 ft. 0 in. to 8 ft. 8 1/2 in., lower heights will require less riser to be used. Stairs can go through well opening, off deck side, or attached to concrete or wood. Aluminum components include powder coated finish. Steel components supplied in black primer or galvanized finish. Designed to meet International Residential Building Code - contact local building department for local code requirements. Styles are Bay, Beach and Everyday. Available in a variety of colors to meet room requirements. Stair case diameters are 3 ft. 6 in., 4 ft., 4 ft. 6 in., 5 ft., 5 ft. 6 in. and 6 ft.. Spindle spacing is 4 in.. Package quantity is 1. 5-Year Limited Warranty From Date Of Purchase On Manufacturer Defects. Spiral Staircase Kit (8 ft.-9 in. to 9 ft.-6 in.) 12 Risers Offer A Variety Of Designs And Layouts To Meet Specific Applications And Environments. Spiral Staircase Kit (8 ft.-9 in. to 9 ft.-6 in.) 12 Risers are constructed of diamond plate aluminum, diamond plate galvanized, diamond plate steel or smooth steel for long lasting durability. Kits available in various styles, colors and diameters. Provides simple installation instructions, step-by-step DVD and all hardware. Code-compliant models include safety-return handrail ends and riser bars. Staircase reaches height of 8 ft. 9 in. to 9 ft. 6 in., lower heights will require less riser to be used. Stairs can go through well opening, off deck side, or attached to concrete or wood. Aluminum components include powder coated finish. Steel components supplied in black primer or galvanized finish. Designed to meet International Residential Building Code - contact local building department for local code requirements. Styles are Bay, Beach and Everyday. Available in a variety of colors to meet room requirements. Stair case diameters are 3 ft. 6 in., 4 ft., 4 ft. 6 in., 5 ft., 5 ft. 6 in. and 6 ft.. Spindle spacing is 4 in.. Package quantity is 1. 5-Year Limited Warranty From Date Of Purchase On Manufacturer Defects. Spiral Staircase Kit (9 ft.-6-1/2 in. to 10 ft.-3 in.) 13 Risers Are Used For Installation In A Variety Of Locations. Spiral Staircase Kit (9 ft.-6-1/2 in. to 10 ft.-3 in.) 13 Risers are constructed of diamond plate aluminum, diamond plate galvanized, diamond plate steel or smooth steel for long lasting durability. Kits available in various styles, colors and diameters. Provides simple installation instructions, step-by-step DVD and all hardware. Code-compliant models include safety-return handrail ends and riser bars. Staircase reaches height of 9 ft. 6-1/2 in. to 10 ft. 3 in., lower heights will require less riser to be used. Stairs can go through well opening, off deck side, or attached to concrete or wood. Aluminum components include powder coated finish. Steel components supplied in black primer or galvanized finish. Designed to meet International Residential Building Code - contact local building department for local code requirements. Styles are Bay, Beach and Everyday. Available in a variety of colors to meet room requirements. Stair case diameters are 3 ft. 6 in., 4 ft., 4 ft. 6 in., 5 ft., 5 ft. 6 in. and 6 ft.. Spindle spacing is 4 in.. Package quantity is 1. 5-Year Limited Warranty From Date Of Purchase On Manufacturer Defects. 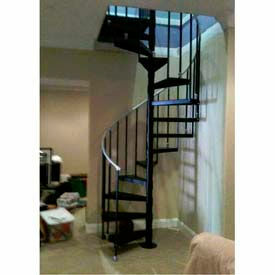 Spiral Staircase - Additional Riser Kits Are Used For Stair Installation & Repair Applications. 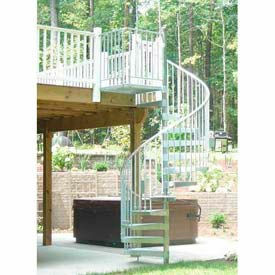 Spiral Staircase - Additional Riser Kits are constructed of wood for long lasting durability. Designed with 30 degree tread rotation. Coordinates with various stair diameters. Package includes 1 tread, 1 main spindle, 3 in-between spindles, riser bar and all hardware. Styles are Bay, Beach and Everyday. Available in a variety of colors to meet room requirements. Stair case diameters are 3 ft. 6 in., 4 ft., 4 ft. 6 in., 5 ft., 5 ft. 6 in. and 6 ft.. Package quantity is 1. 5-Year Limited Warranty From Date Of Purchase On Manufacturer Defects. 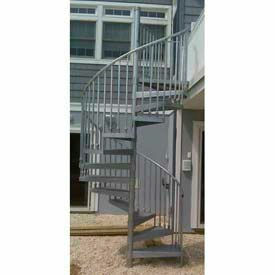 Spiral Staircase - Balcony Railings (Rails Only) Are Used For Installation In A Variety Of Locations. 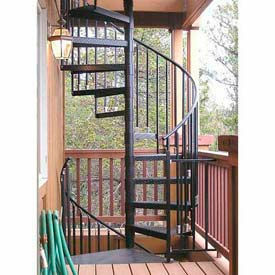 Spiral Staircase - Balcony Railings (Rails Only) are constructed of 3/4 inch x 3/4 inch aluminum or steel tubing for long lasting durability. Available in a variety of styles, sizes and colors to meet location specifications. Overall height 38-1/4 inch to top of rail. Includes all installation hardware. Second rail required on landing if attached off side of loft or deck. Styles are Bay, Beach and Everyday. Available in a variety of colors to meet room requirements. Stair case diameters are 3 ft. 6 in., 4 ft., 4 ft. 6 in., 5 ft., 5 ft. 6 in. and 6 ft.. Spindle spacing is 4 in.. Package quantity is 1. 5-Year Limited Warranty From Date Of Purchase On Manufacturer Defects. 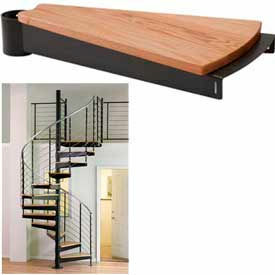 Spiral Staircase - 13 (Risers Only) Package - Red Oak Add Style And Support To A Variety Of Staircase Styles. Spiral Staircase - 13 (Risers Only) Package - Red Oak are constructed of wood for long lasting durability. Designed with 30 degree tread rotation. Coordinates with various stair diameters. Package includes 1-red oak tread covering and hardware. Quantity of risers are 11, 12 and 13. Color is Red Oak. Stair case diameters are 3 ft. 6 in., 4 ft., 4 ft. 6 in., 5 ft., 5 ft. 6 in. and 6 ft.. Tread lengths vary. Package quantity is 1. 5-Year Limited Warranty From Date Of Purchase On Manufacturer Defects.